S.O.N – Saviour of Nails. So, what can potentially ruin a perfect manicure? No matter how perfectly you’ve applied the nail polish, dry and jagged cuticles will spoil it. And if you want to be perfectly groomed, you have to be groomed up to your cuticles. Yes. I know not everyone, including myself, like to have their cuticles snipped away. I hate how it makes the fingers feel painful and raw. This oil will make ugly cuticles disappear by hydrating and soaking them in Vitamin E goodness. They become transparent, and you don’t see them! Works better than any handcream. And the oil does not leave my hands greasy after I rub it into my cuticles and nails. Update on Nov 25 2013: If you got an ombre gel manicure, this oil can help your nail art last longer. Apply it on cuticles to hydrate them, and the edges of the clear gel polish somehow become less flaky too. So your mani remains perfect-looking. 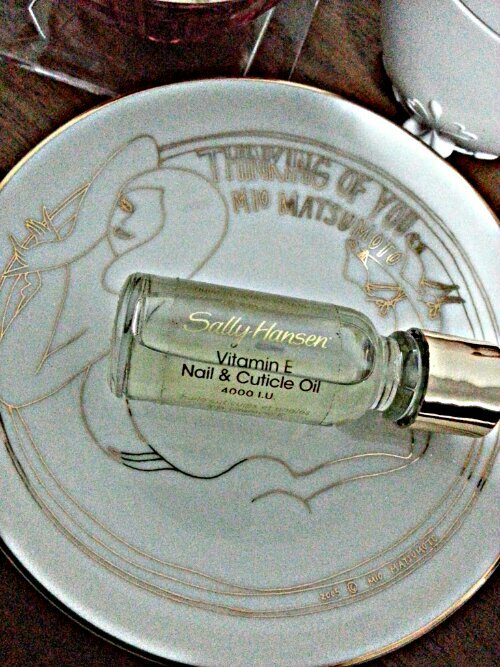 The oil also helps your nails to be stronger and healthier when you have gel polish on.